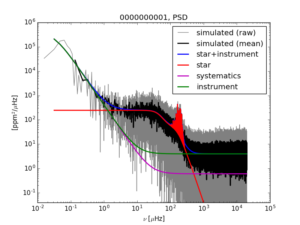 PSLS simulates solar-like oscillators representative of PLATO targets. It includes planetary transits, stochastically-excited oscillations, granulation and activity background components, as well as instrumental systematic error and random noises representative for PLATO. The program also manages the existence of the time shift between groups of camera. Planetary transits are included following Mandel & Agol (2002) equations and using the Python implementation by Ian Crossfield at UCLA. 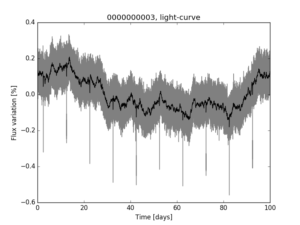 Red-giant stars: oscillation spectra are based on the Universal Pattern (Mosser et al 2011) together with the mixed modes patterns derived from the asymptotic theory (see e.g. Mosser et al 2012). Rotational mode splitting are implemented in a simplified manner. Some illustrations are displayed here below. Note the current limitations of the program: the parameters of the activity component still need to be specified by the user. It is planned in the near future to implement some prescriptions for the activity component as well as a spot modelling. This simulator is not an official product of the Plato Mission Consortium (PMC), it is distributed under the terms of the GNU General Public License in the hope that it will be useful, but WITHOUT ANY WARRANTY. (c) 2017 by Réza SAMADI, LESIA – Observatoire de Paris.